Welcome back! Hope you got inspired by day #1 sneak peek of February release from Taylored Expressions. Today is day #2 and I have more new products to show you. 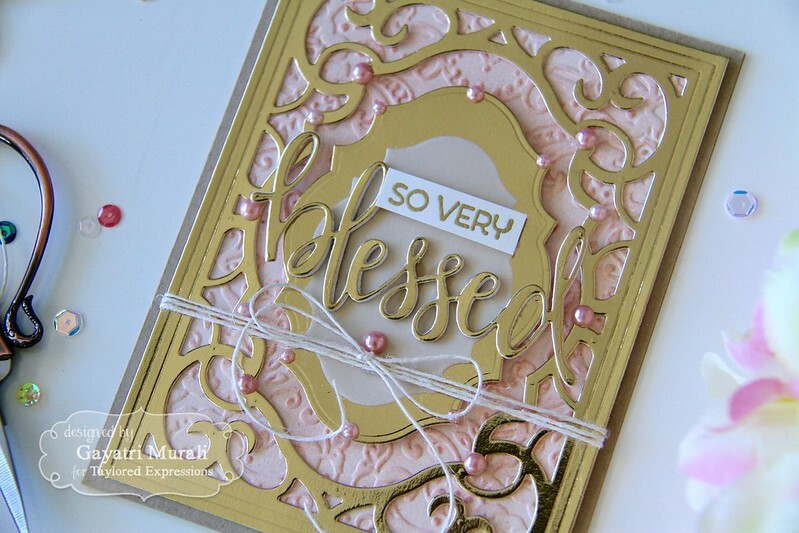 First I have a beautiful stamp set called So Very Blessed. This set is a small set with beautiful sentiments. There is a coordinating die called Blessed Script die. I have combined these two products with another new product called Ornate Frame cutting plate to make my card. How beautiful is this ornate frame? I LOVE this die and it is a must have product in my opinion. So I used gold mirror cardstock to die cut the ornate frame and frame the beautiful Blessed sentiment. 1. My card base is made out of Toffee cardstock. 2. I die cut the Ornate Fame cutting plate using gold mirror cardstock. I also die cut the ornate inlay using gold mirror carstock and vellum paper. 3. I ran a Sugar Cube card panel through TE Damask embossing folder, then sponged Tattered Rose distress ink to highlight the damask pattern. This panel is trimmed to 4″x5.25″. 4. The focal sentiment is made using Blessed Script die. I die cut one out of gold mirror cardstock and two out of sugar cube cardstock. I stacked and glue them with the gold mirror die cut on the top. 5. The smaller sentiment is gold heat embossed on a strip of sugar cube cardstock. 6. To assemble the card, I adhered the ornate frame on the embossed panel using foam adhesive and used natural twine to wrap and tie into a bow. 7. The vellum inlay die cut is adhered on the gold mirror die cut with the Blessed sentiment die cut on the top. This is inlaid in the centre of the ornate frame using foam adhesives. Then the smaller sentiment is adhered just above the blessed sentiment. 8. Finally embellished with rose pearls which coordinates with the Tattered Rose on the embossed panel. Here is a closeup picture of the card. Here are the card supplies I used to make this card. The second new product I am showcasing today is a coordinating die set for an older stamp set. 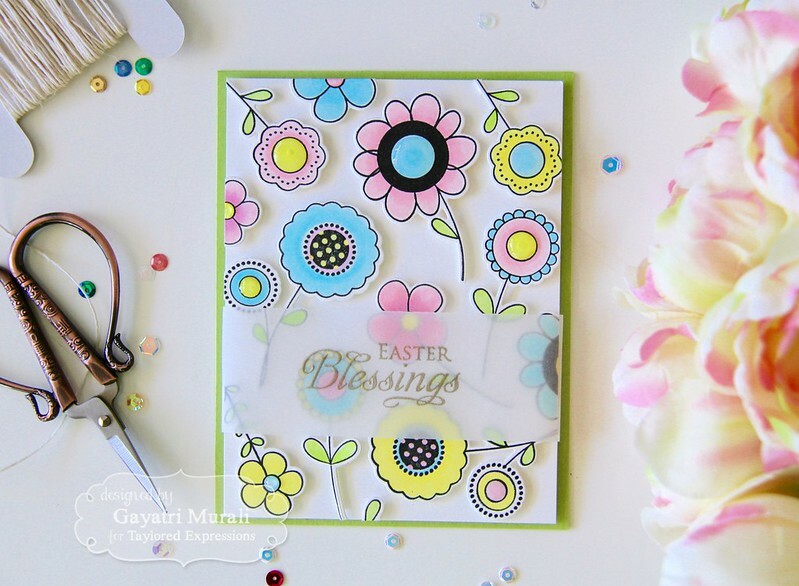 This coordinating die set is called Faith in Bloom which coordinates Faith in Bloom stamp set. I coloured the floral images, die cut using the coordinating dies and make the background for my card. 1. My card base is made using Granny Smith cardstock. 2. I stamped the floral images some of them twice from Faith in Bloom stamp set, coloured them with copic markers in pastel colours, then used the coordianting dies to die cut them out. 3. I trimmed a Sugar Cube cardstock to 4″x5.25″ and adhered the floral die cuts randomly using foam adhesives. The over hangs were trimmed off with scissors. 4. 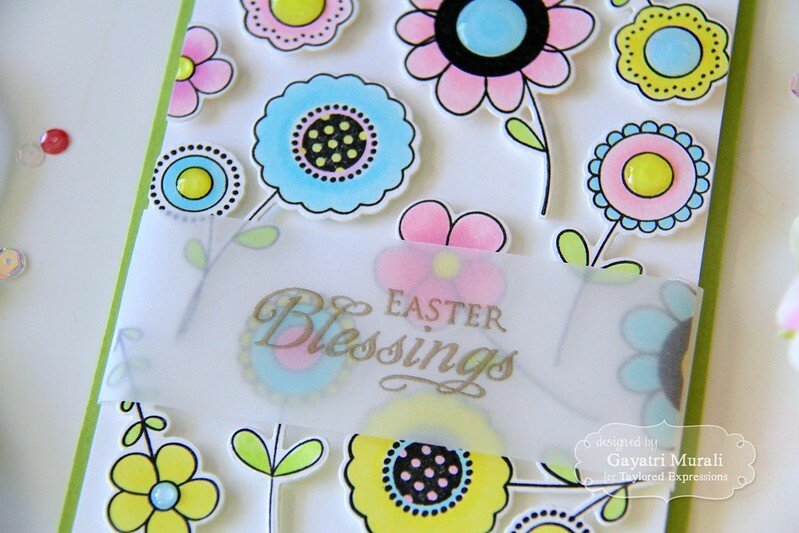 The sentiment is from He is Risen stamp set which is heat embossed using Liquid Platinum embossing powder on a strip of vellum paper. 5. I wrapped the vellum around the floral panel and adhered the entire panel on the card front. 6. I brushed the flower centres with clear shimmer using Wink of Stella shimmer pen and added glossy accent to a few flower centres. Hope you liked sneak peeks of all the products today and are inspired by my projects. Check out Taylored Expressions Blog for more details. This month, we have got two ways to earn DOUBLE CRAFTY POINTS! If you’re not a Crafty Points member, it’s free and easy to join. Just create an account at the TE webstore and you’re automatically enrolled to begin earning crafty points with every purchase. For a limited time, you’ll earn 120 Crafty Points on the purchase of the Enamel Shapes Bundle and 54 Crafty Points on our Exclusive Lattice Frame Cutting Plate! Offers valid on qualifying purchases made between 9am CST on Thursday, February 9, 2017 and 11:59 pm CST on Sunday, February 12, 2017 and only while supplies last. Crafty Points are only available on purchases made via our Taylored Expressions store. While you are there, check out gorgeous inspirations from the rest of the designers using the sneak peek products. Tomorrow is day #3! See you with more TE projects. Oh your cards are just STUNNING!! I love the gold and pink color combo on the first card. The second card is adorable with all the flowers!! Great design.